Spencer Hammond, former longtime minister of music, organist and choir director at Douglas Memorial Community Church who also taught music in the city public schools for more than three decades, died Thursday, January 24, from complications from a fall. The Pikesville resident was 88.
xJames Spencer Hammond, who was born in St. Augustine, FL, and raised there, was the son of Spencer Hammond, a carpenter, and his wife, Catherine Holloway Hammond, a homemaker. As a youngster, he told Baltimore Sun music critic Tim Smith in a 2015 interview, he would rush up from the basement of the St. Augustine Baptist Church on Sunday mornings the moment he heard the organ motor cranking up 10 minutes before the 11 a.m. service. “I got a kick out of listening to that organ,” he said. Not long afterward, Mr. Hammond, who enjoyed listening to radio broadcasts of the Metropolitan Opera and New York Philharmonic, began studying organ and piano, and conducting. “The organist said, ‘I don’t want no kid waving his fingers at me,’ but I stood on a chair and conducted,” Mr. Hammond said in the 2015 interview. He was a 1946 graduate of Excelsior High School in St. Augustine, which at the time, was a segregated educational facility. Mr. Hammond received a bachelor’s degree in music in 1950 from Florida A&M University, where he was a member of the Marching 100 band, and a master’s in music from Northwestern University. In the 1940s, he went to hear the Rev. Marion C. Bascom, a fellow Floridian, who was preaching at a church in St. Augustine, out of which grew a lifelong personal and professional friendship. The two men shared a passion for classic gospel music. “I’m talking about high-class gospel music, the kind that was sung by Wings Over Jordan, the Deep River Boys and the Southernaires.” Mr. Bascom made a promise to his friend. “Marion told me, ‘If I get a big church, I’m going to send for you.’ People say that stuff to you when you’re young, and it’s nice to hear, but it doesn’t always happen.” Mr. Hammond was teaching music in St. Petersburg in 1959 when Mr. Bascom, who had moved to Baltimore to pastor Douglas Memorial Community Church, visited St. Petersburg, and offered him the job of minister of music, organist and choir director. “As a partnership, it was a powerhouse,” Mr. Hall said. 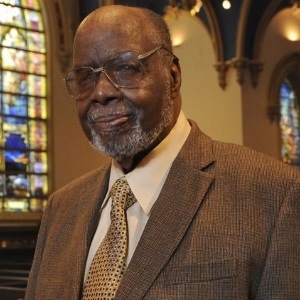 Mr. Bascom, who was also venerated for his civil rights activism, retired from Douglas Memorial in 1995 and dies in 2012. In addition to his work at Douglas Memorial, Mr. Hammond taught music in city public schools for 31 years until retiring in the early 1990s, also taught a course on African-American music at the University of Maryland, Baltimore County for several years, and taught piano. For the past two years, Mr. Hammond had been a member of Brown Memorial’s hand bell choir. Register Now for Pedals, Pipes, and Pizza!